Satisfy all of their taste buds with an abundance of fresh fruits combined with delicious gourmet selections. Elegantly finished with cellophane and a bow, the basket holds fruits such as apples, oranges, bananas, and pears along with gourmet items such as chocolates, nuts, crackers, and more. A delicious way to send your best wishes. Delightful Combinations is a hand delivered gift. These gifts are delivered by one of our local design centers located throughout the United States and Canada. Same day delivery is available for most gifts when ordered before the cutoff time. The cutoff time for Delightful Combinations is 12 PM in the recipient's time zone. It went above and beyond of meeting my expectations. So beautiful and well worth the price. Great experience - Great product! Josh in customer service went above and beyond customer service to make this gift basket reach it's intended recipient. She was overjoyed with the the fruit & cheese basket! I was pleased with the service. Delivery on time as requested. I sent this as a birthday gift, and the recipient was amazed.at how full of goodies it was, and how artfully it was arranged. She couldn%u2019t wait to dive into it!! I%u2019m very pleased! My Grandson loved his birthday gift. I'll be ordering for all my Grandchildrens Birthdays. The order process was painless and the representative was very helpful, her voice was clear and pleasant, I don't think I had to ask her to repeat anything. I didn't see the finished product, but our office received a message from the recipient that she absolutely loved the basket and the combination of fresh fruits, nuts, & chocolates was a nice surprise compared to the usual floral arrangement. I was drawn because of the combination and it turned out to be a great choice! Received many praises on the two deliveries I made! Sent the delightful fruit basket to my sister for her birthday. It arrived on time, even though I ordered it the day before. She called and said it was "a fabulously beautiful presentation", and seemed genuinely happy with the contents. So thank you GiftTree for doing all the work! My sister loved it! She stated her husband dove into it right away like a gorilla. (delicious bananas) She stated it was beautiful, wonderful, and had a great presentation. I will order again and highly recommend. Thank you for great job! The recipient was thrilled with the basket overflowing with fresh fruit. The fruit was tasty and the munchies were so appreciated for a snack for the week long stay in the hospital. The basket and the healthy goodies inside were just what the Dr. ordered! My recipient loved it, everyone was jealous and wanted to pick at the items within the basket but the person held it to her heart in love. When I received a thank you call from the person to whom the basket was delivered, I was assured that I had selected a 5-star rated gift. It seems the basket of bountiful goodness is just what the doctor ordered, and the luxurious basket is making him feel more like a king than a patient recovering from surgery. Presentation was excellent. Delivery was fast. I highly recommend this gift basket. The family was very pleased... they said it ranked a 10. Thanks again! I bought this basket for my father in law for Father's Day, and he was very impressed. He said the fruit was very fresh, and loved the reusable basket. My mom celebrated her 71st birthday a few days ago and as usual I agonized over what to get her. She lives out of state but I never miss an important date in her life. I did a search to find out what would fit her personality and found this site. The attendant was extremely patient and recommended several items. We settled on the Delightful Combinations basket. My mother was beyond thrilled. She commented on the quality of the gift basket and the attention to detail that went into putting it together. Father's Day is coming up and trust me, I will be back! These baskets were wonderful and greatly appreciated! The recipient told us "it had everything you would ever want to eat". They were delighted with it. my brother appreciated his after surgery fruit basket very much! he said the fruit tasted wonderful and fresh. Perfect combination of healthy and fun! We sent this gift as a sympathy gift. The response that we got from the recipient was that it was perfect: healthy foods for her body and chocolate for her soul. As the sender, we appreciated the fast service and easy ordering. I sent this to my Dad for his 90th birthday. There was lots of stuff in there that I did not know was in there. He loved it. There was a good variety of fruit among other things. Student who loved fruit for smoothies loves it! I was extremely pleased with the item, and certainly with the service. We received a phone call when the item could not be delivered on the scheduled date and then an email when our recipients were not home. The communication was very helpful. The basket was lovely. Job well done! The recipient of this delightfully created basket was astonished at how beautiful the basket looked and was impressed with the attention to detail that was taken. Example: Included in this basket was a small pair of scissors to open varied items. As this was created as a Sympathy Basket, you certainly took their minds off their loss as they enjoyed viewing all the different items that was part of this wonderful Basket. Thank You. Money well spent! Normally, the pictures look better than the actual product. This was NOT the case for this product. While I didn't get to see it personally, the Nurses and CNA's that I sent it to were floored with the presentation and variety. They said that everything was so good, they didn't know what to enjoy first! Thank you for making it easy for me to give thanks to the wonderful people that took care of me for my week long hospital stay. I will definitely be back for more gifts! This Absolutely wonderful arrangement was extremely well received by father-in-law for Father's Day! Didn't see it myself but he was pleased! Although I didn't see the basket, I did receive a call thanking me for it and complimenting the items and presentation. Includes more than just fruit -- nuts, crackers, etc. -- so it has something for everyone's taste. Due to my order being placed on a holiday weekend, the delivery was delayed. I received three personal phone calls and follow up e-mails explaining the situation and given the opportunity to cancel the order. Very nice customer service. I wish all companies were like this. I will be using this company again because of great customer service. I ordered this basket early afternoon, and by 5:30p.m. it was delivered!!! Great job! Recipient loved it! Thanks! I purchased this basket as a gift for my Father on his birthday and he was VERY pleased with the size, weight, and quality of the fruit that arrived! I ordered this basket and it was delivered in less than 24 hrs. from the time I finished at your website. I would definitely order this gift again and recommend it for any fruit lover. Thank you for your concern about the basket being 1 hour late than expected, and for giving me a $10 gift card for that, even if I said it would not be necessary. The basket was well assorted, the fruits fresh, and beautifully wrapped. It was a birthday gift to my husband - he loved it! I sent this to my grandmother for her birthday and she loved it! Basket was large, full of fruit and other snacks. I felt it was a great value for the price as well! I didn't upgrade the basket but everyone in my family believed that I had spent a ton of money on it. Bought this gift for my mother and she absolutely loved. Ordered the same day, and presented beautifully! You guys are a lifesaver. Recipient loved the gift. Like others I was weary of ordering from an online retailer; however, I was not disappointed! The gift arrived on time and in perfect condition. The basket also came at a much lower (more than 30%) price than my local companies who for the same price offered less and delivered later. This gift made a big hit . Was very well received. Went to my sister in hospital & was just the boost she needed. Would recomend this to anyone. Best basket I"ve ever sent. Sent my mother house warming gift to here home her and husband to that's out of state. Was able to have delivered there the same day she arrived there which was from was great cause that was whole idea so it was amazing they were able to delivery same day.....and my mother loved the basketball arrangement. Since I wasn't sure of the recipient's "favorites" this was perfect with fruit and snacks. Big hit! The receiver of the basket was very pleased with the content in the basket and also the potted flowers that were sent. I was very impressed by the expedience of delivery. The items that I ordered were delivered within 5 hours of the placement of the order. I will use this company again for sure. Always a bit risky to order something like this from an online retailer you don't know, to go to someone out of town because it means I won't see it to evaluate it. Especially risky if the recipient is an elderly lady in a nursing home. So I was holding my breath...but according to her daughter, the basket was a generous variety of very fresh fruit, beautifully presented...all I hoped it would be...and delivered on time, too! Thanks so much! 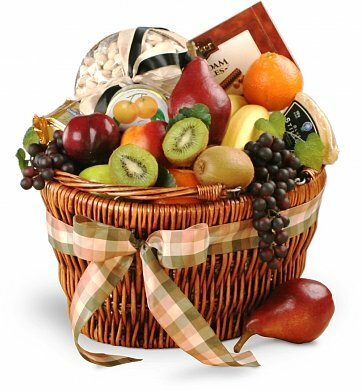 Ordered this as a housewarming gift and the recipients were thrilled with this fruit filled, snack packed basket! They said there was so much packed into it! Customer service, communication, delivery all excellent! Thank you! All of the fruit was beautiful! And my friend enjoyed it so much!